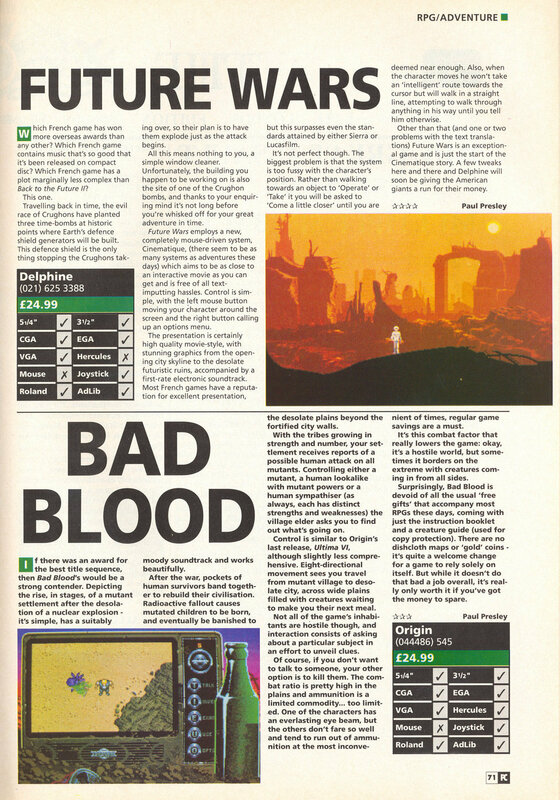 This is the final review I’ll be uploading from PC Leisure magazine, Bad Blood from the Autumn 1990 issue. The reviewer loved the intro but was less keen on the game. I notice from the review that as often happened, us Brits got done out of the extras that came with the USA release. Something I noticed today is that I’ve now posted over 2000 screenshots on this blog which considering I started out saying I wasn’t going to take many is quite a few but its a lot easier than taking notes. I start out today trying to free the human being held by mutants in one of the villages. I kill off all the guards then grill him for information. He tells me about a plot by the human leader to implicate mutants in the capture of Captain Equitus and thereby cause a war. I go back to give the oracle the news. He sends me back to Yvrium. He tells me I will need a collar to get in which I picked up ages back. I put the collar on and walk straight in. I ask around and find out that a mutant is being held captive in the city. I kill off the guard then release the mutant. He gives me a password to the mutant underground so my next job is to find it. It turns out to be in Zero City. there is a room in one of the towers with a couple of guards. I tell one the password and he gives me instructions to press the fire alarm in the next room. When I do this a trapdoor in the floor opens up. There are new graphics for the subway and it definitely looks the part. I’m given instructions to report to the leader down here but I have to get through the barriers first. I find out that using a token (found in the building above) opens the barrier and I can get through to the rest of the level. The Himukk knows me by reputation and mentions a human being held in Dominix’s palace. This has to be Equitus. Before I go he tells me about an underground city beneath the palace which I may be able to use to gain access + I will also need the key to the cells from the captain of Dominix’s guards. I head back to Yvrium and get attacked by a giant red bear thing on the way. This thing doesn’t seem to want to die so I run away. Back in Yvrium I find a rogue who tells me how to get into the underground city and sells me the rope I will need to do it. I still need to get this key though. When I mention the Captain to the guy at the bar he gives me a meal to deliver to him at the barracks. I now spend about 15 minutes walking around the city trying to find the barracks. Eventually I discover it in the far north. The guards let me in. I attack the captain, take the key, then make for the town well. Everyone in town is attacking me at this point but I manage to avoid too much combat and climb down safely. The underground city is a lot less hostile than the 2 underground areas I remember from Times Of Lore but I do have to take out a few rats in the first room. There are also green tentacles that burst out of the floor when an alarm goes off. I’m well stocked up with hearts so there is nothing to pose a problem. The city here is basically a maze with buttons all over the place to press, which call lifts, open doors, call elevators etc. I just have to figure out the correct order to press them. After a lot of wandering around I get to some barbed wire which I hack with my vibrablade weapon. Behind this are some guards and the prison cells I’ve been looking for. I try and few cells and when I get to the right one the end cutscene starts. This has to be one of the shortest games in this entire blog. I’ve not spent much more time on it than I did on Akalabeth months back. Having worked my way through the whole thing and I can’t say I’m much the wiser than when I started. There is quite a bit of plot during the intro and ending but everything inbetween is pretty much throwaway. 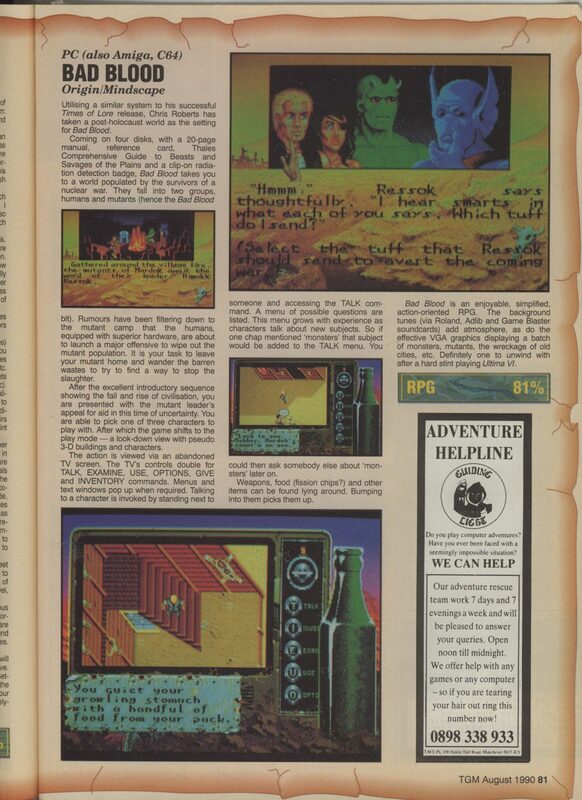 Times Of Lore was a nice game technically as it was clearly ahead of its time with adlib support and the game engine looking massively better than Origins other products at that time. The gameplay on the other hand was relentless and despite the game being short, I had definitely had enough by the time I finished it. I’m surprised at just how similar Bad Blood turned out to be and was expecting a lot more from it. There is clearly more variety in graphics and weapons but the underlying game is even simpler. It is also quite a lot shorter and easier which is surprising for a sequel. I really don’t know what market Origin were targeting with the enhanced version. The gameplay doesn’t warrant it and despite the enhancements it is still very outdated. I’d reasoned that I should leave it until nearer the re-release year (1994) rather than jumping forward then back but even after the update its still far less impressive than Wing Commander and Ultima 6 both of which came out in the same year as the original (1990). For all this I didn’t really dislike Bad Blood but I didn’t like it much either. It basically failed to make any impression whatsoever and is ultimately the most forgettable game I’ve played since Wing Commander Academy. I have to confess I haven’t been especially looking forward to this game for some reason. You could even say I’ve been putting it off with the excuse that the remake I’m playing came out in 1994. I’m in the middle of 1993’s games at the moment but I thought it was high time I gave this a go. This is a sequel of sorts to Times Of Lore in that it uses the same engine. I guess my problem is that while Times Of Lore wasn’t a bad game I wouldn’t exactly have rushed out to buy a sequel as by the time I’d finished it the simple gameplay and endless monsters had just about worn out their welcome. Bad Blood is technically another Chris Roberts game although I’m a little dubious as to how much involvement he will have had in it given that Wing Commander came out the same year as this. At least this is a change from the usual fantasy, swords, sorcery, orcs and the like. This game takes place instead in a post apocalyptic world where just a few humans survive in isolated city while mutant cities have sprung up on the outside. The humans have enslaved some mutants to acts as slaves while others fight in games in the manner of gladiators. The twist here is that you are actually playing as one of the mutants. At the end of the manual you have been summoned by your village leader to a meeting. The intro sets the scene for the game. A war is coming between humans and mutants but you should really be working together. The leader needs to choose one of 3 warriors to go forth and bring the two sides together for the common good somehow. This is where I get to pick which character I’m going to play (just like in Times Of Lore). There is a similar choice of characters. One is an obvious mutant but is the strongest, the woman will pass as human but if she lifts her eyepatch she blasts stuff with some sort of beam (ala Cyclops in X-Men). The final character is to all intents and purposes human with no special abilities. I remeber how much combat was in Times Of Lore so I choose the big green guy. The first thing I notice when I start the game is the size of the screen. It is absolutely tiny. You would have thought Origin would have made this a bit larger for a remake. The bottle on the right with my water supply is effectively a health meter. I wander around for a bit. This remake has a few advances on Time Of Lore. The VGA graphics are an improvment (although nothing too special). All the sound effects are done on PC speaker and the game really feels like a bit of a relic after playing Privateer yet this remake came out a year later. I guess its being faithful to the original version at least but I should have played it with the 1990 games. The engine really hasn’t changed much at all from times of lore. It has the same basic conversation with key characters. I can go around collecting anything that isn’t nailed down. As soon as I get out of the towns monsters are all over the place and certain types drop certain goodies. Playing this is very much a case of deja vu. I can at least carry more than one of each item this time which should help no end. I get my first quest of the game which is to seek out the Oracle. This gives me a new coversation option so I go around asking everyone about Oracles. I get pointed in the direction of the shaman of another village. There is a map in the manual so I head off for Nivvik. One nice touch is that the backdrop changes according to the time of day. In Nivvik I find out that the shaman has been abducted. A bit more questioning later I find out vaguely where to look for him to the south. I walk around for a long time looking for this captured shaman. Strange things happen when you get to the edge of the world here but I still haven’t found him. The shaman is in a hut to the north of worlds end. He is being guarded by snake mutants who sell other mutants to the humans in return for being left alone. I kill his guards and ask him about the Oracle and he tells me to look right back in the North of the map near his village. On the way back I find a human town with huge stone walls. They don’t take too kindly to me and won’t let me in so I leave quickly for now. These shelled creatures almost always drop a fresh heart when I kill them. If I then use this heart my water gets fully restored so I make a point of killing every one I see. There are a lot more weapons in this game than I remember in Times Of Lore. I’m mainly just using a whip but there are shotguns, uzis, bow and arrows and all sorts of stuff. The whip seems to work well and I’m never short of hearts now I know how to get them so its pretty easy going so far. I don’t manage to get across the lake and go all the way back to free the captured Oracle (again) and this time ask him about the lake and he tells me to ask the fisherman for a bote. I get the boat for just a bit of food which I’ve plenty of. The boat is actually a little dinghy which I paddle across the lake in. A lot of wandering around caverns later I find a likely looking cave. Sure enough the oracle is inside. In typical fashion he is completely unhelpful and sends me to the opposite corner of the world to fetch him an apple. The apple is in Zero city. This place is full of ruined tower blocks as well as monks in cowls who worship the “fruit of the ancients” which sounds like my apple. The apple turns out to be an old Apple 2 computer. The moment I grab it the monks all turn on me so I use my usual cowardly tactic and run away. Pretty much all combat can be avoided in this game just like Times Of Lore. If anything its easier here than it was in that game. The oracle accepts the apple and decides to be a bit more helpful. He tells me I need to free a human being held in Okkarn who can supposedly help me out but I’ve no idea how. I’ve only spent maybe an hour on this game but I’ve already seen about half the towns in it and walked across most of the map. I get the impression its not going to be a lengthy game. Despite my misgivings going into it, I’m quite enjoying it this far but its definitely nothing special.